I came across this problem recently that required solving for the maximum-sum path in a triangle array. Let’s say you’re on the penultimate level 2 4 6 and you have to iterate over it. This is the end of first iteration and you got the line of sums 10 13 15. …and you finally arrive at 23 as the answer. I read the triangle array into Python and successively update the penultimate row and delete the last row according to the algorithm discussed above. This code is the key to solving problems 18 and 67 of Project Euler. Like many of my previous posts, this post too has something to do with a Project Euler problem. 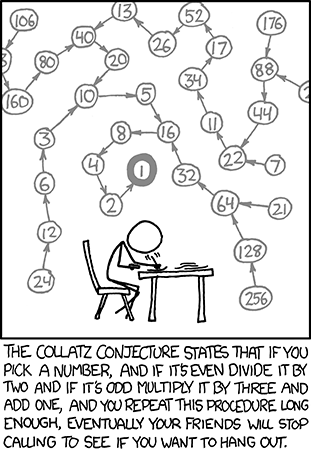 Here’s a sketch of the Colatz Conjecture. If the conjecture is false, it can only be because there is some starting number which gives rise to a sequence that does not contain 1. Such a sequence might enter a repeating cycle that excludes 1, or increase without bound. No such sequence has been found. contains 10 terms. Although it has not been proved yet (Collatz Problem), it is thought that all starting numbers finish at 1. 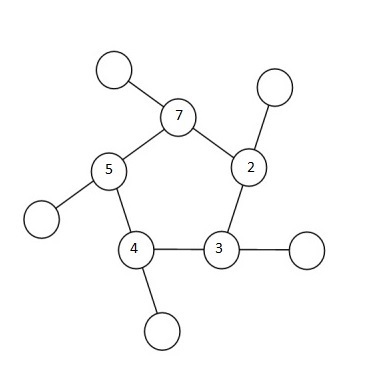 Which starting number, under one million, produces the longest chain? 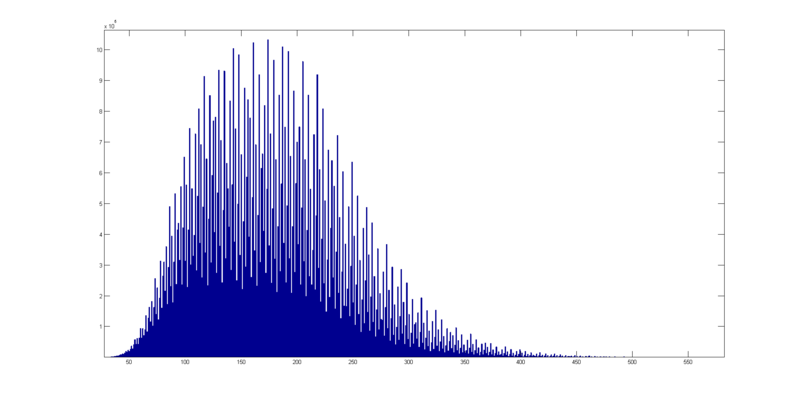 Histogram of stopping times for the numbers 1 to 100 million. Stopping time is on the x axis, frequency on the y axis. This isn’t much of a problem really, but since I’m posting solutions to all the Project Euler problems I solve, I’ve been OCD’d into posting this one too. Besides, it illustrates the simplifying power of Python as a language? The solution is cake really, and I don’t care whether this was worth posting on my blog or not coz I wasted my time solving this problem anyway, and it shouldn’t have been for nothing! All ∑n numbers are Triangle Numbers. They’re called so, because they can be represented in the form of a triangular grid of points where the first row contains a single element and each subsequent row contains one more element than the previous one. Problem 12 of Project Euler asks for the first triangle number with more than 500 divisors. First Step: Find the smallest number with 500 divisors. Seems like a good starting point to begin our search. 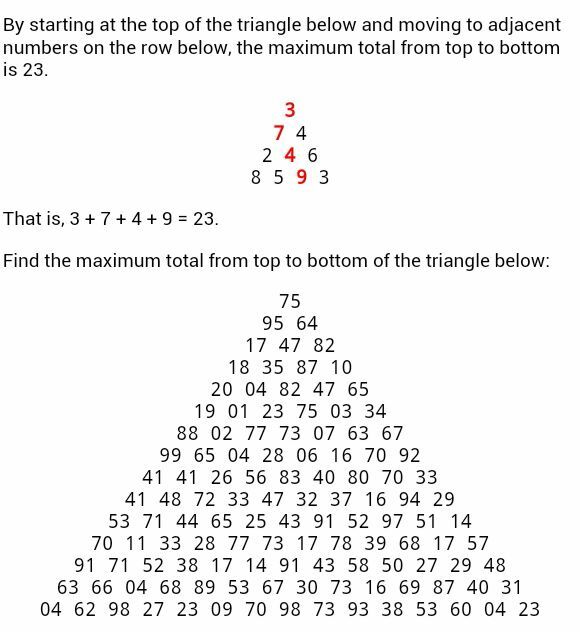 Fourth Step: Add (n+1) to the last triangle number found, to find the next triangle number. Check whether this number has 500+ divisors. If yes, this number is the answer. If not, repeat Fourth Step till the process terminates. Where p, q, …, r are prime, while α, β, …, γ are positive integers. 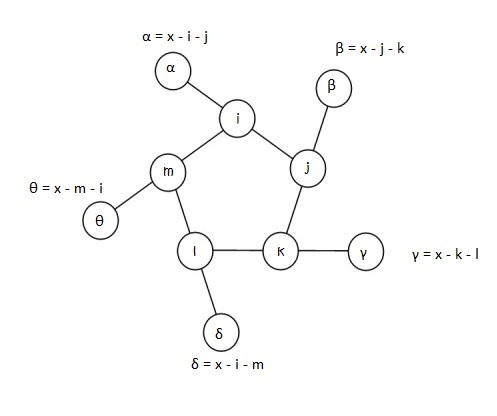 Such representation is unique up to the order of the prime factors. So, the number in question should be of the form abq4r4s4 where a, b, q, r, s are primes that minimize abq4r4s4. This is satisfied by 7x11x24x34x54 = 62370000. This marks the end of the First Step which is where we start our search for our magic number. 3.1.2 if i and n/i are unequal, add n/i to the list too.